A longtime fixture of the Dayton food truck scene, Katie Marks of The Wicked ‘Wich of Dayton will be closing at the end of this season to deal with recently discovered serious health concerns. Rallying around her, The Yellow Cab and all of the trucks for the September 15 monthly Yellow Cab Food Truck Rally will be participating in a very special Sandwich Rally for Katie. 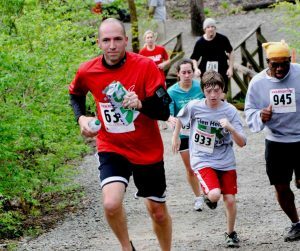 At the September 15 Sandwich Rally for Katie, participating trucks will be donating $1 from every sandwich or specified item towards her medical bills. The Yellow Cab will also be donating a portion of the night’s bar sales to help. Trucks participating in the Sandwich Rally for Katie will be Ramen Rickshaw, El Meson, Smokin’ Bee-Bee-Q, Thai1On, Greek Street Food Truck, The Drunken Waffle, Hunger Paynes Food Truck, Sweet P’s Handcrafted Ice Pops, Flying Santucci Bros., and Creme de la Creme Cakery. 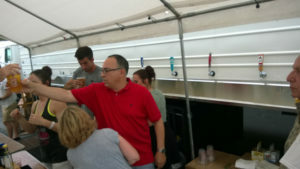 Local craft beer will be on draft, cocktails available at the bar, The Night Market will feature an array of local artisan vendors and live music is planned. For those interested in attending the Yellow Cab Food Truck Rally, the event takes place on the third Friday of every month through October from 5-10pm. The Sandwich Rally for Katie will be at this month’s event on Friday, September 15. A few weeks ago I met a couple girlfriends at the Yellow Cab Building for the Brunch Food Truck Rally. Since brunch is my favorite meal of the week, I was geared up to go. I was properly caffeinated, had cash in my pocket, and my pants had a little stretch to make way for all the yummy food ahead of me. When I got there I was shocked by the amount of people who had the same plan in mind. Everywhere I turned the lines were long. I thought to myself that surely no food that came out of a truck could possibly be worth waiting for, but wait I did. We landed on the always fresh and delightful Shakery Juice Bar since my friends and I were looking for something light and healthy to eat…but smells of waffle batter and maple syrup kept wafting in my direction. Where was this heavenly scent coming from…? Of course the truck with the longest line of the day: The Drunken Waffle. As I practically licked the last of my acai berry bowl, I made a mental note to wait for some waffles the next time. Fortunately the next time came around much sooner than I had expected. The Drunken Waffle was parked out back of the Cannery Loft Apartments the very next weekend, so my husband and I decided to give some waffles a whirl. We ordered two meals and decided to split them. I went relatively traditional with the “50 Shades of Swine,” a bacon wrapped breakfast sausage cooked into the waffle batter. It was accompanied by a jalapeno maple syrup that wasn’t overly spicy, but left a nice lingering tickle on the tip of my tongue. My husband took a left at classic and went with a dish that was full of twists and delicious turns: The War Pig. This dish had ham, bacon, Monterey Jack cheese, and a scrumptious herbed mayo sandwiched in between a spicy, 3 pepper waffle. He also got a side of asparagus that were perfectly seasoned and cooked. All in all, the meal was as whimsical as the names of the dishes, the flavor combinations were spot on, and the portions were not overwhelming. Most importantly, the waffles tasted good, they were fluffy and flavorful. I always appreciate when a restaurant (or in this case a food truck) can introduce some creativity into their food without losing focus of the basics. 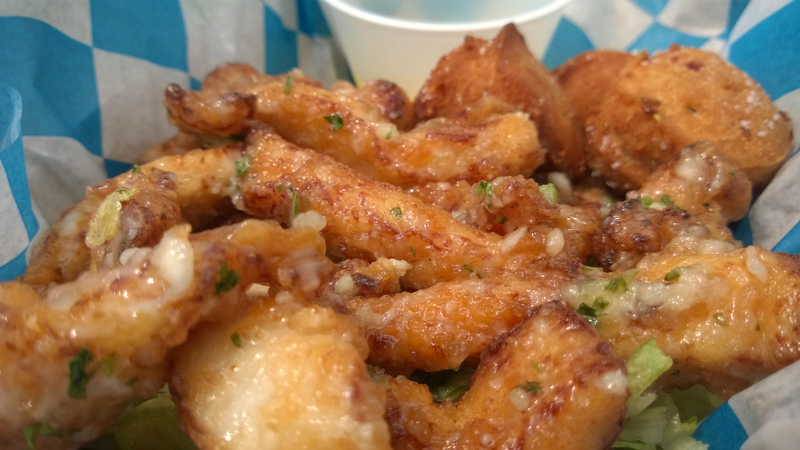 The Drunken Waffle’s food is fun and exciting while still keeping the flavors at the forefront. Trust that it can be really, really good, and yes, it may even be worth the wait! Brunch! Food Truck Rallies at the Yellow Cab are held on the first Sunday of every month, through September. Katie Marks is the owner of The Wicked ‘Wich of Dayton, a food truck that specializes in fresh, made to order eclectic combinations to basic build-your-own sandwiches brought to the streets of Dayton. 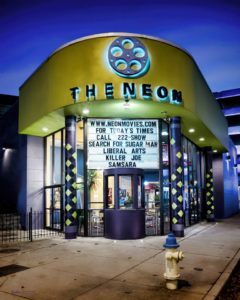 They offer food different from your normal routine; combinations of sweet and savory on delicious local bread, along with a variety of options for vegetarians. 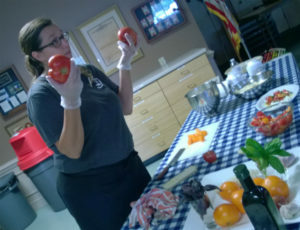 Not only is she passionate about the food she delivers, she’s also passionate about Dayton. 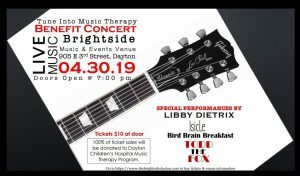 The Wicked ‘Wich of Dayton is throwing their 3rd annual launch party, with all proceeds going to TJ’s Place of Hope and Building Bridges, two great non-profit organizations in the Dayton area serving at-risk youth. Come for an evening of great music, local craft beer, raffle prizes, an d amazing food! What is your favorite ingredient to cook with? My favorite ingredient to cook with is garlic. I think the best dishes begin with fresh minced garlic (not the jarred stuff). It usually has a hiding spot within all of our creations, including my home ones. What ingredient do you dread? Onions. I am so sensitive they are like mace. Fortunately, I have a great crew on hand to make sure they are taken care of. What’s your favorite dish to make? 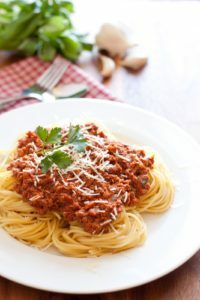 What’s your favorite pig out food? My favorite pig out food is The Root Beer Stande on Wilmington. There’s nothing better than their Mac-and-cheese bites and a root beer float. 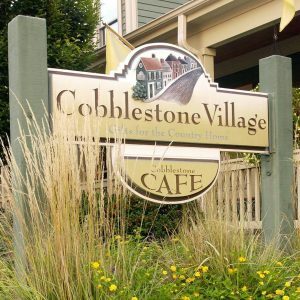 What restaurant, other than your own do you like to dine at in the Miami Valley? This is such a difficult question, because there’s so many innovative and talented chefs in the area. I wish I could give a top 5, although I’ll try and get away with food truck and brick-and-mortar. PA’s Pork always has my heart with their take on different styles of cuisine, while Wheat Penny has me with their out-of-the-box style and fabulous wood fired pizza. What’s your best advice for home chefs? My best advice for home chefs would be to try something out of your comfort zone. Don’t be afraid to mess something up, sometimes the best creations come from complete accidents or mistakes themselves. Try out of the box combinations. Cilantro and marmalade on a sandwich was because it was all that was in my refrigerator. If you could invite any 4 guests to a dinner party who would they be and why? 1. The Wright Brothers. I have always admired their innovation, intelligence, and dedication to a concept. Their brilliance changed the way the entire world works, and it all started right here. I would also want to ask about being alive through the transition from horse and buggies to fighter jets and electric start automobiles. 2. James Yancey. 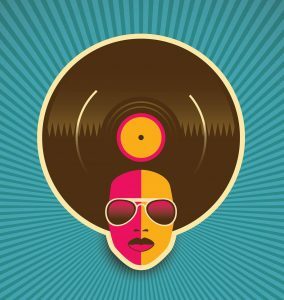 Known in the music industry as J Dilla, he was a producer back the 1990’s that was celebrated for his sample methods with the very simple tools he used. I would say he is proof that it isn’t the artist’s tools, but the artist themselves that can create beautiful masterpieces with what they have. 3. Jack Joyce, one of the founders of Rogue Brewery in Oregon. I have always been fascinated with their business model and marketing. The company is ran strictly word of mouth, and they have a great concept in their bottling and labeling. Several of their ingredients even come from Rogue Farms, their own farm dedicated to the brewery. I highly recommend the Pumpkin Patch Ale during the fall, and any of their Voodoo Donut ales they come out with every year. 4. Paul Lawrence Dunbar. After reading his poetry, I would want to hear his story and also what his life was like in Dayton. 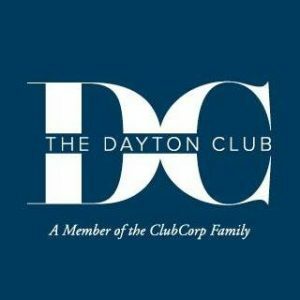 I feel like he is a very underrated part of Dayton history, and often overlooked. Who do you look up to in the industry and why? I look up to Angela and Pete Olejnicek from PA’s Pork. They have been amazing mentors and friends as we’ve navigated the food truck waters. Angela is one of the smartest people I’ve ever met and is so talented at what she does, and Pete is also extremely talented along with handy. It always seems like the two of them can get through anything, and have used their wisdom and experience to help me through some tough times. What do you do in the Miami Valley on a day off? I always love hiking Glen Helen, and treating myself and my partner to a local venue for the evening. I am almost never disappointed with the local dining options, and the breweries here are incredible. I’ll also venture out to local shows, for we have some extremely talented bands that play in the area. We are so excited for the changes and hard work we’ve put in over the winter. From the feedback we’ve received, we’ve come up with some faster logistics, opened up an expo window in the back, and have begun some new sandwiches that we cannot wait to share with you! We love you guys and cannot put into words how much we have appreciated the support over the last two years. Here’s to an amazing third season!
? ?Sunday we are at The Old Yellow Cab again! Only this time it’s for Brunch! A food truck rally, brought to you by The Drunken Waffle and Smokinbeebeeq. There’s some great trucks and we will have an awesome menu! Check it out in the comments section on Monday. Slow-cooked teriyaki chicken is paired with Havarti cheese, with sunflower kerns for a smooth flavor and crunch with pineapple preserves for a sweet finish. Sliced almonds provide a little crunch to turkey, fused with white cheddar while paired with cilantro and orange marmalade. Roast beef is paired with Swiss cheese, then a layer of sautéed mushroom, onion, and green pepper, then finished with our housemade garlic-parm mayo. Sautéed mushrooms are sandwiched between two slices of Swiss cheese with giardiniera (pickled vegetables, popular with Chicago-style pizza), then topped off with our housemade Cabernet ketchup. Default cheese is cheddar, although you’re welcome to ask about the different cheese we have that day. Add lettuce, tomato, onion, or pickle as well. Order from your office before your break or on your way home, and pick up your food ready to go! 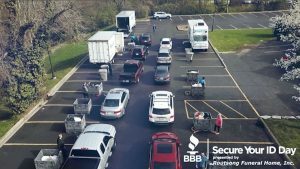 Click the link below for some mobile carryout with a twist. For more on the Wicked ‘Wich- hear them on the Gem City Podcast. Everyone loves doing weekend brunch. Everyone loves going to a food truck rally. 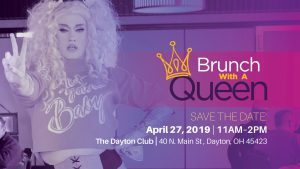 Now, Drunken Waffle presents Dayton’s first best-of-both-worlds with Brunch! A Food Truck Rally on Sunday, September 25 from 10am-2pm at the Yellow Cab. 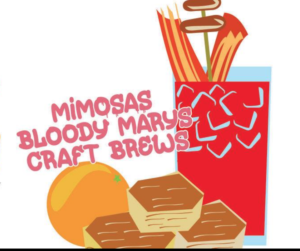 Serving up brunch options alongside Drunken Waffle will be local favorites Smokin Bee-Bee-Q, Greek Street Food Truck, Harvest, El Meson and Son of a Biscuit in addition to special guests Lily’s Bistro serving Beignets and Boston Stoker serving coffee. 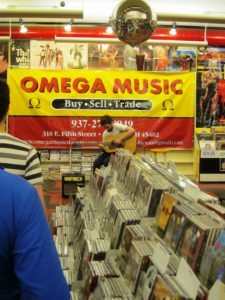 In addition to food and drink, live entertainment is also being planned. The faint smell of garlic is in the air! 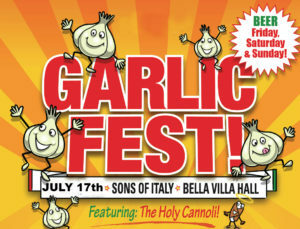 Today being National Garlic Day, it gives Dayton Most Metro the perfect opportunity to announce that GarlicFest is returning this summer to the Sons of Italy’s Bella Villa Hall. We are again partnering with the John Pirelli Lodge for this popular event. 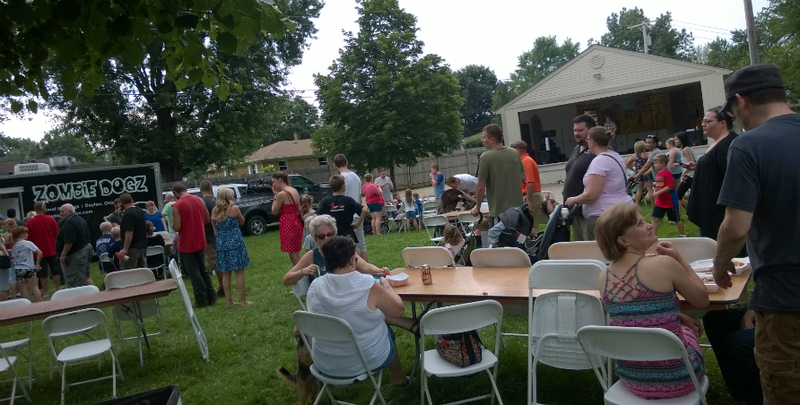 Food Adventures is honored to be helping with the festivities. 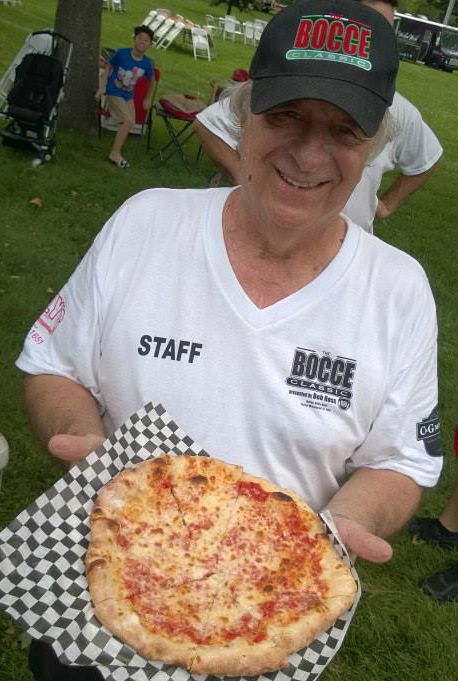 The same weekend also features the annual bocce ball tournament called the “Bocce Classic,” which is in its 22nd year. The Bella Villa Hall venue is located at 2625 County Line Rd. 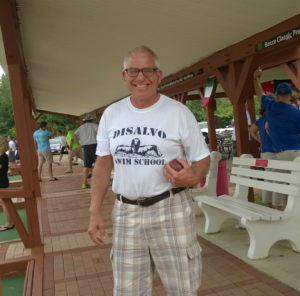 in Beavercreek, the same place the Italian Fall Festa is held. 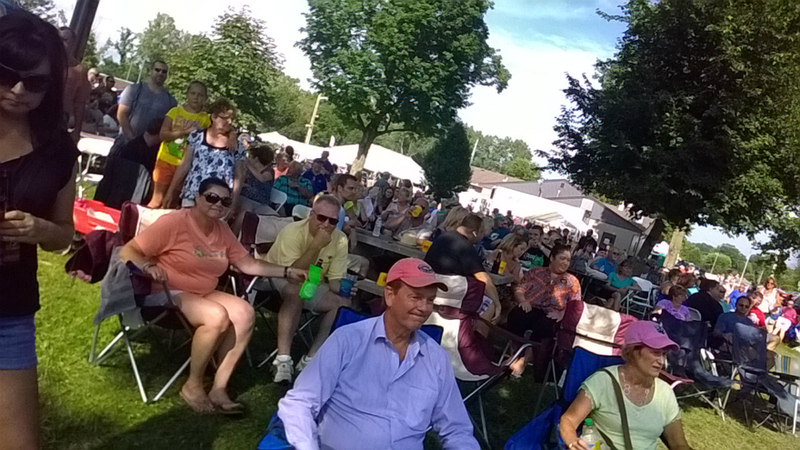 The Garlic Festival, Sunday July 17th. 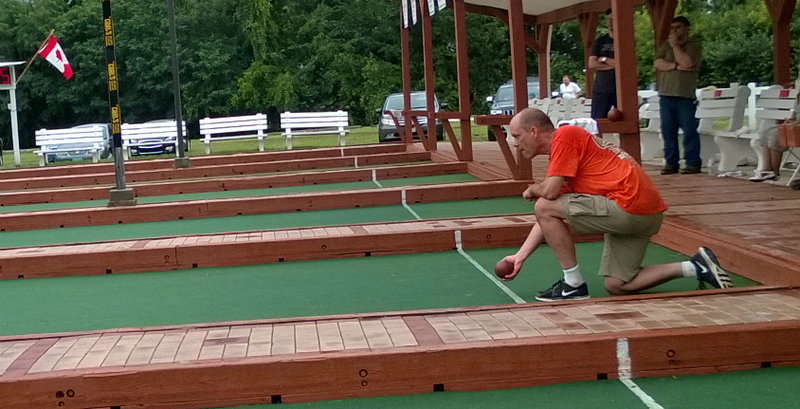 One new attraction will see local celebs, and Up Dayton groups square off Friday Night, July 15th in a “Beginner Bocce Bash.” A Single elimination bocce tournament with cash prizes for the top 3 teams. Just $40/team to enter. There will be soft drinks, beer, and more. There will be bocce ball, and the Garlic King and Queen. 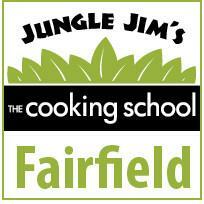 Chef House and Hungry Jax from Food Adventures, will be hosting cooking demos with garlic inside the hall. Weezy’s Garlic, Spices and More will be there with all kinds of garlic goodies for you to buy! 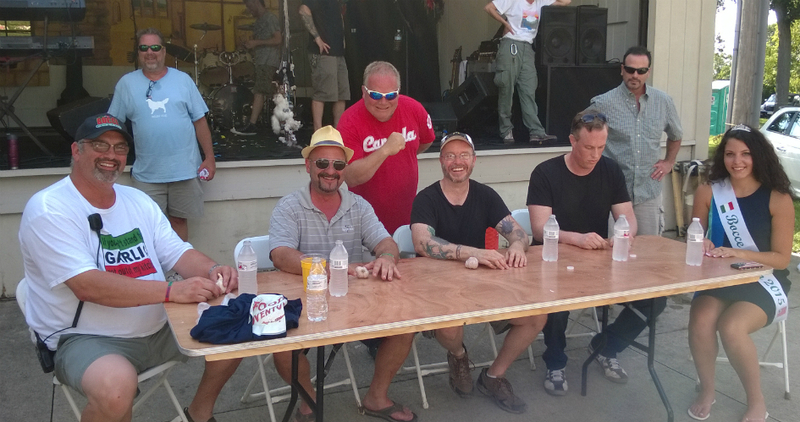 Don’t forget the Garlic Eating Contest with host the Big Ragu and a Live Band ! With so much to do and so much to eat, you may have to make a couple of trips back during the weekend…. 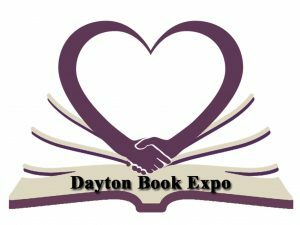 We will announce more vendors as they confirm…. 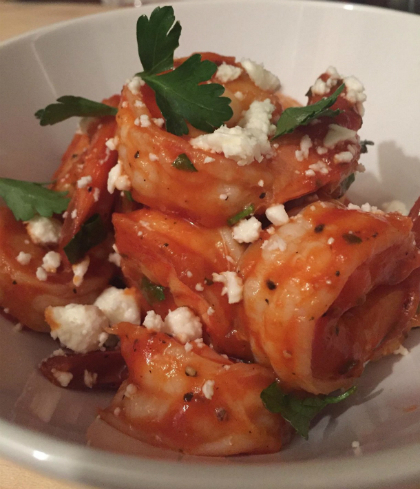 Feel free to follow Food Adventures on Facebook by clicking HERE. Food Adventures has super secret info that we have been waiting months to release right here on Dayton Most Metro. 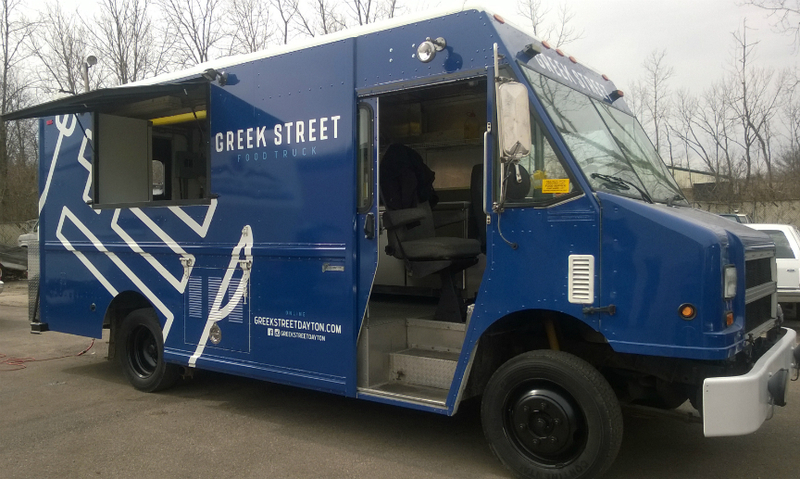 It concerns Dayton’s newest food truck, that will soon make a splash in the Miami Valley. The scoop is so fresh that their website isn’t up yet, but you can find them on Facebook —>here. 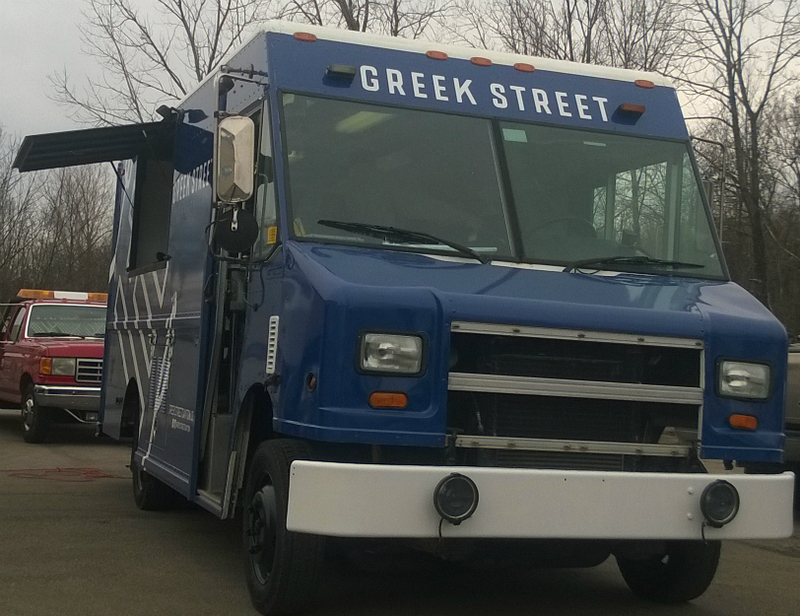 THE GREEK STREET FOOD TRUCK is putting the final touches on its menu and final tweaks on operations, but looks ready to roll. 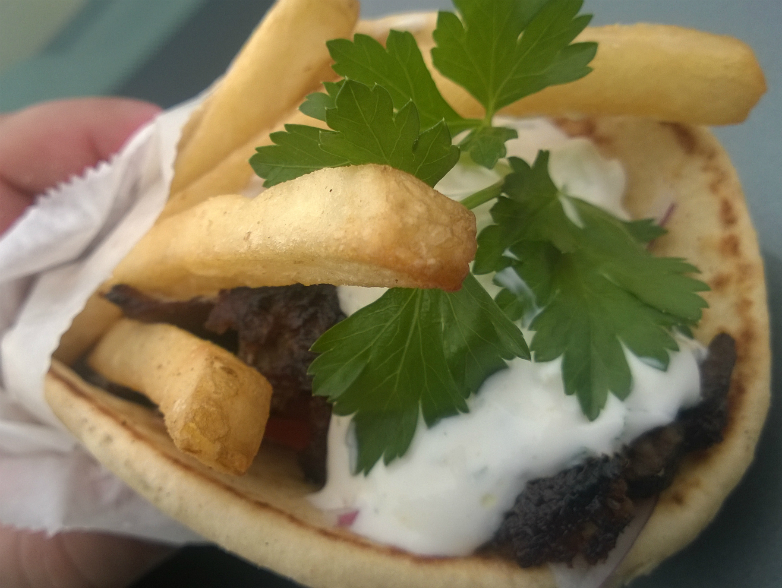 We are excited because this will be the first strictly “Greek Based truck” that we know of and brings further diversity to an already incredible selection of local food vehicles. 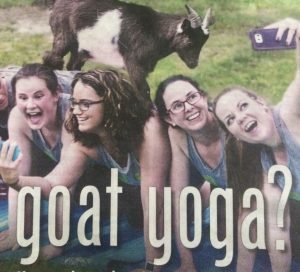 So whats the scoop on the new kid in town? 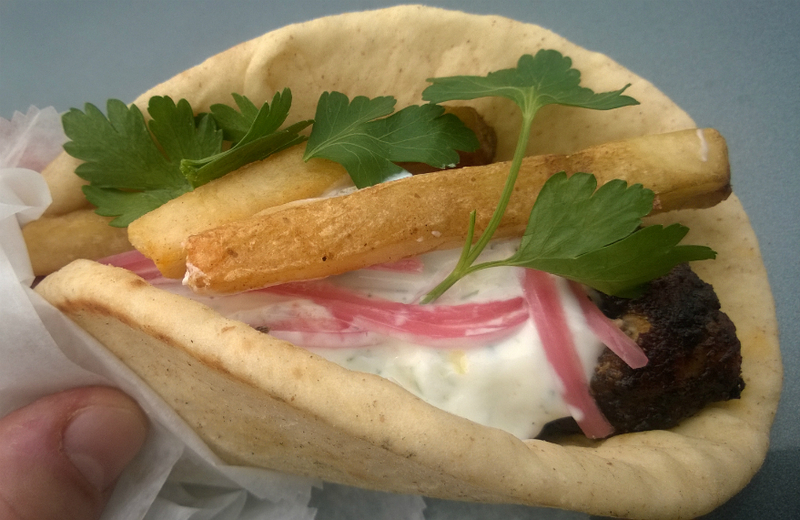 Who is behind the Greek Street Food Truck? 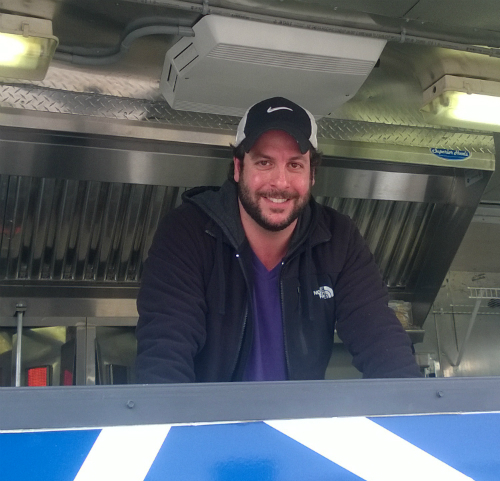 — CHEF CHRIS SPIRTOS, owner and operator of Greek Street Food Truck has an extensive cooking background. — Chris went to Le Cordon Bleu College of Culinary Arts in Chicago to hone his craft. The Centerville native, also worked at L’Auberge and as a sous chef at Sung’s Korean Bistro in Cincinnati. — Chris also studied under the Chef for Oprah Winfrey, Chef Art Smith, while living in Chicago. He was so well thought of, that Chris was flown to Oprah’s California home to help fix a dinner she hosted for the first graduating class of her school in Africa. 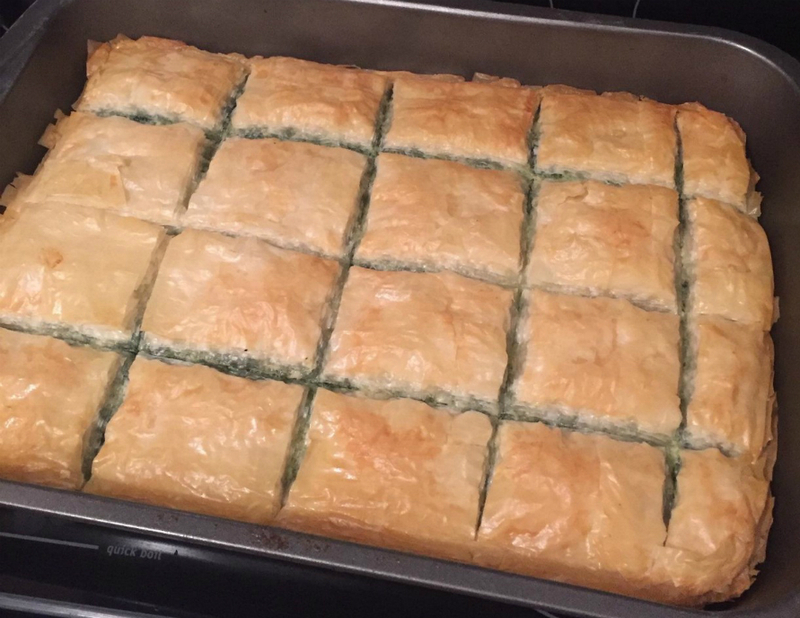 — Born into a Greek family (his grandparents were from Greece), Chris’ recipe for Baklava is his mom’s, and it is a traditional favorite. What type of eats can you expect on the truck? 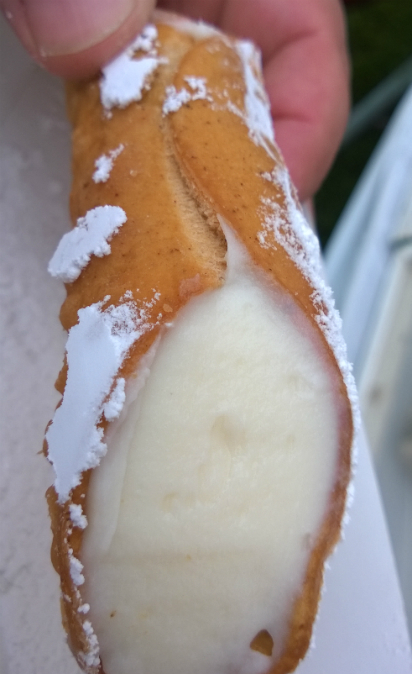 Food Adventures has all the scoop right here. — The meats are individually layered on a spindle and cooked. There are no compressed or processed meats. Just a Beef/Lamb mixture spindle, and a Chicken spindle. 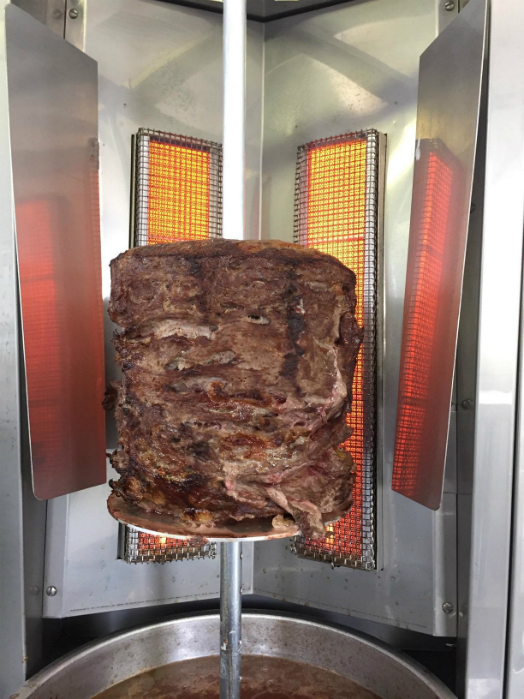 Each gyro is sliced to order. 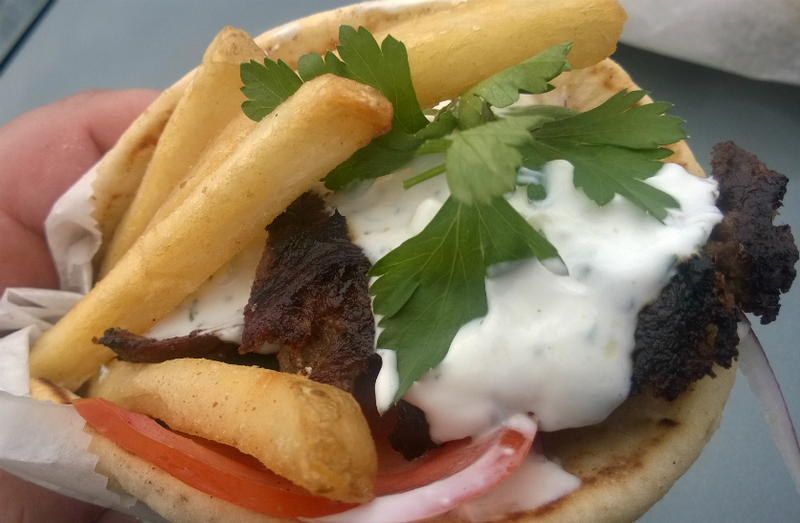 Now, without further delay, let’s give you our menu items from Greek Street Food Truck that are absolutely, “Must Eats”…. 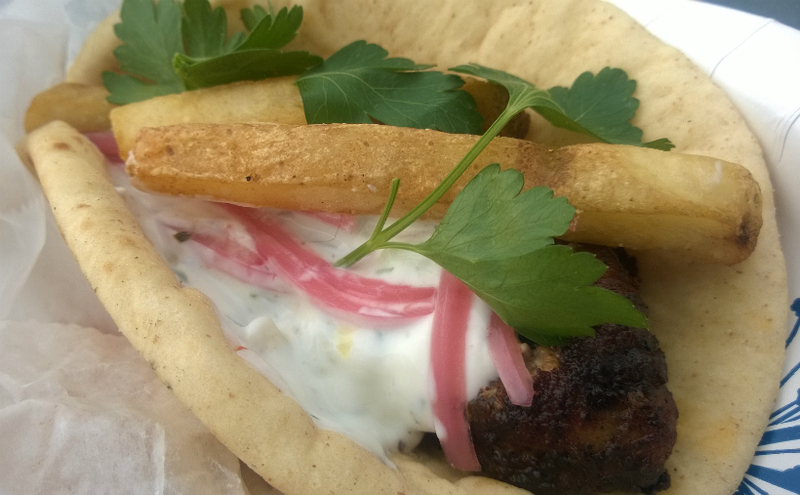 — CHICKEN GYRO, STREET STYLE: Stacked rotisserie chicken breasts slices, piled into a pita and topped with “street style toppings.” Street style means: tomato jam, pickled red onions, crumbled feta, fresh herbs, fries, and tzatziki sauce. 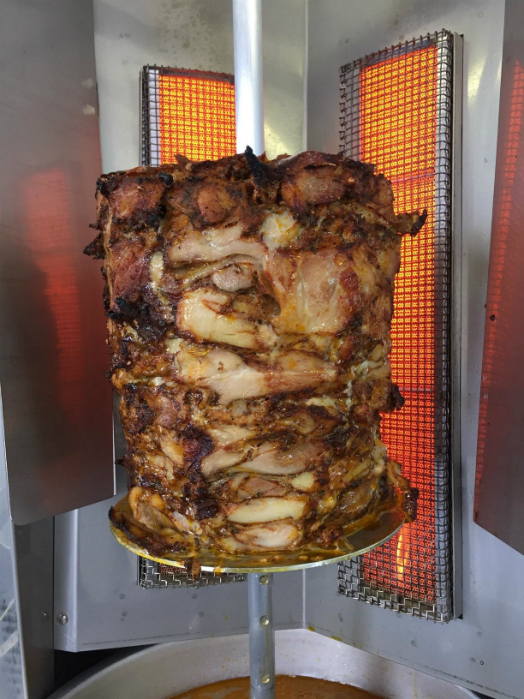 Quite honestly, one of the most flavorful and unique gyros we have had. If you try one thing, this is item to grab. 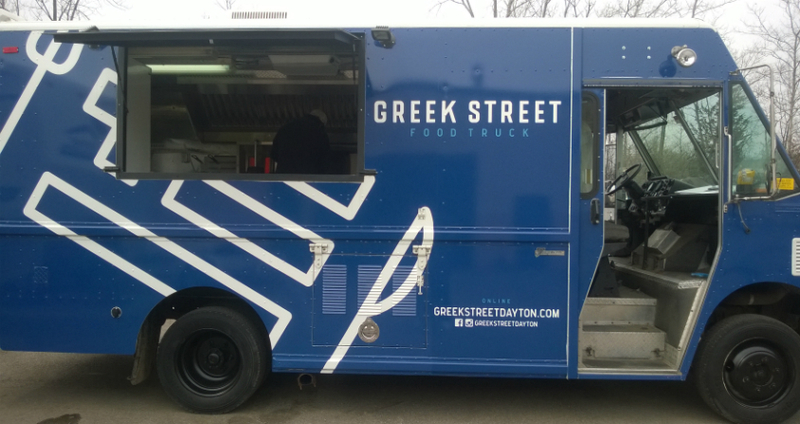 We are excited for the first Greek themed entry into Dayton’s food truck scene. 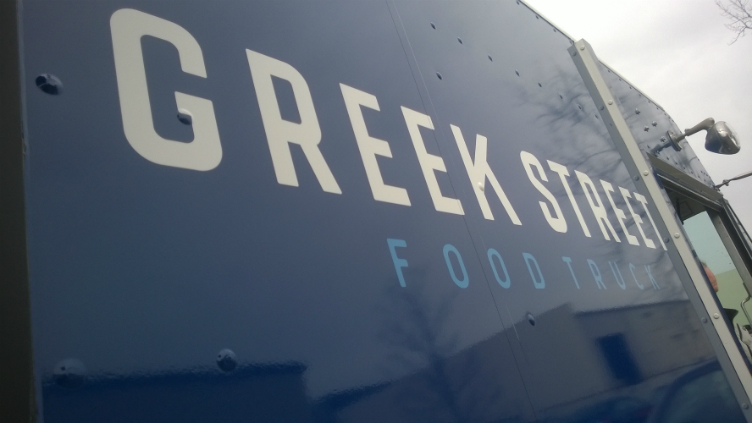 The Food Adventure crew of The Big Ragu, Chef House, and Hungry Jax, wish Chris good luck with his “Big Fat Greek Food Truck.” We think Greek Street will be a huge hit… here’s to you .. OPA ! 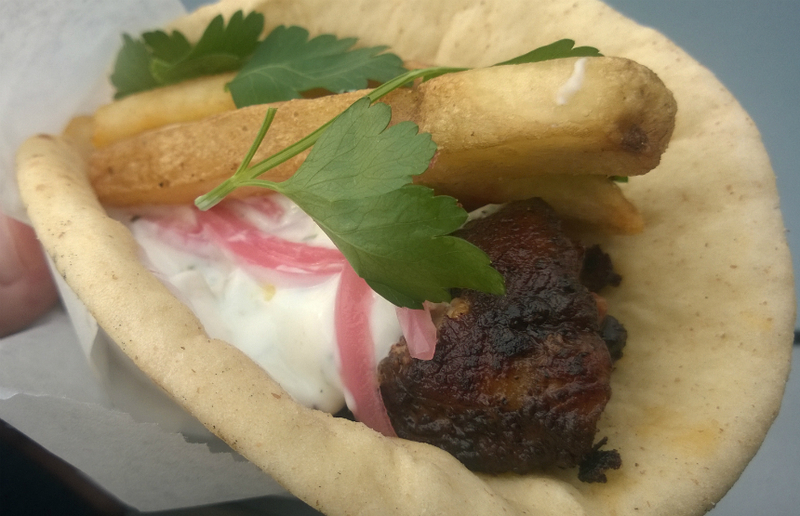 Below are more practically edible photos of the luscious food at Greek Street Food Truck. 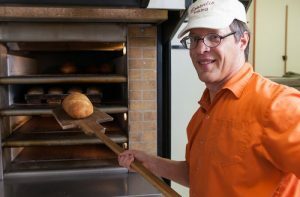 For the best photos and info on Dayton’s food scene, “like” Food Adventures on Facebook by clicking HERE. Also, follow Chef House, The Big Ragu and Hungry Jax on the Instagram Food Adventures account by clicking HERE. 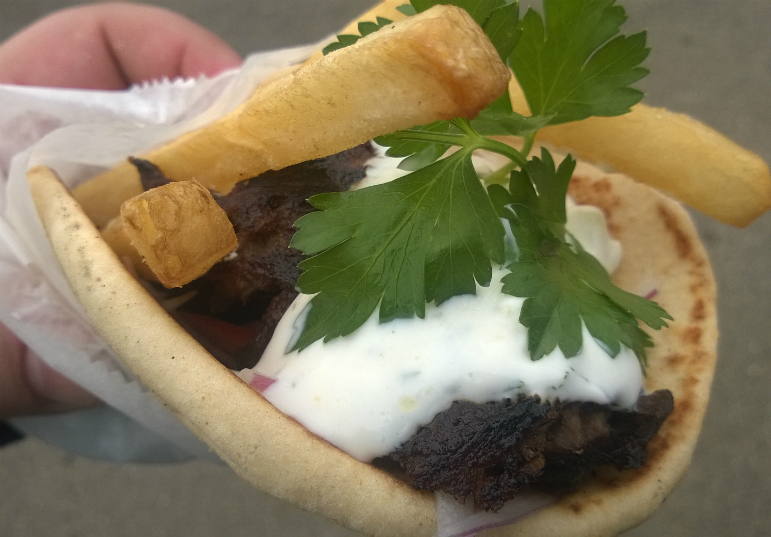 The Chicken Gyro Street Style is a MUST EAT ! 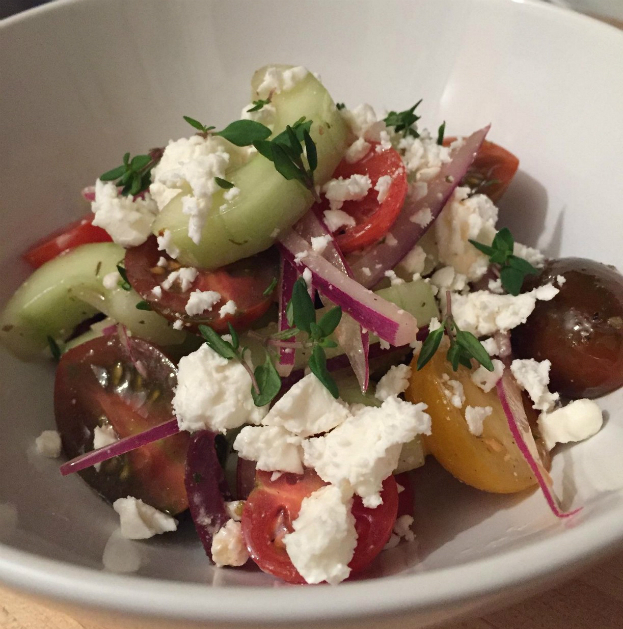 Handful of Greek Street Food ! 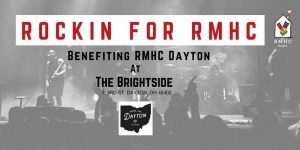 According to Vanessa Back of the Dayton Food Truck Association, “each truck will have a tip jar and those proceeds along with a set % of sales from each truck (which she did not want to disclose) will be donated to be split amongst the four charities.” Guests are encouraged to bring donations for the chosen charities. “New Dog #2” Zombie Dogz Latest Pup! With Halloween approaching and The Walking Dead Zombie show starting back up, it is the perfect time for a Zombie Dogz Food Adventure article! — Zombie Dogz is a food truck that takes hot dogs to a gourmet level with their unique toppings and handcrafted side dishes. — Mom and pop establishment founded in 2012 by David and Lee Ann Van Artsdalen. They recently welcomed the newest member of their family this spring, baby Barrett Axel! — Budget friendly at only $6/dog, you’ll be able to feed your own pack a hot dog that’s been grilled, tucked into a grilled bun and topped with combinations that will make you howl in delight! — Not a carnivore? No worries! They offer tofu dog’s as a substitute. — In the “ZD” logo, you’ll see the silhouette of David and Lee Ann’s dog, “Gauge”! He even has a Zombie Dog named after him, the “Killer Gauge”. Zombie Dogz offers up hot dogs that will surely make you salivate! 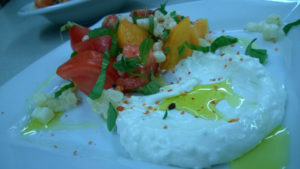 You can find a full menu on their website, however they rotate it weekly to offer a wide variety. To see what Specialty Dogz are offered this week, and to stay on top of their latest creations, tune into their Facebook page HERE. 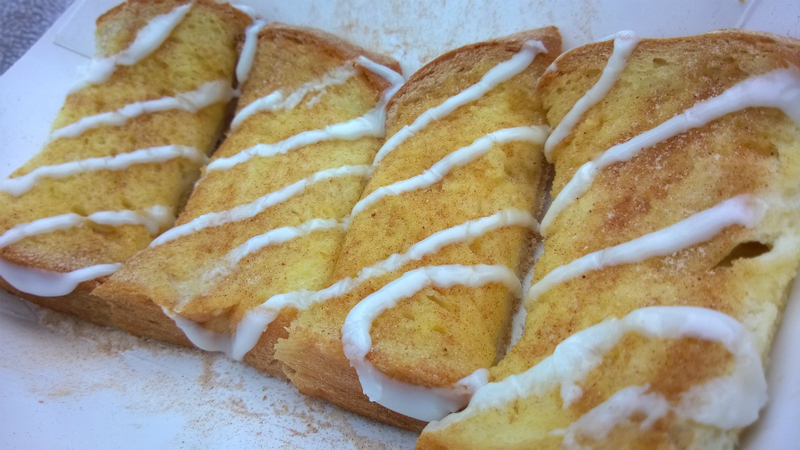 They have so many delicious dogz, that it’s hard to nail it down to a few faves….. but we did. Here are our top dogz aka Must Eats !! — CALLING IN DEAD: There’s nothing dead about this dog. An all beef hot dog topped with a creamy homemade white truffle mac & cheese and finished off with crumbled crackers. 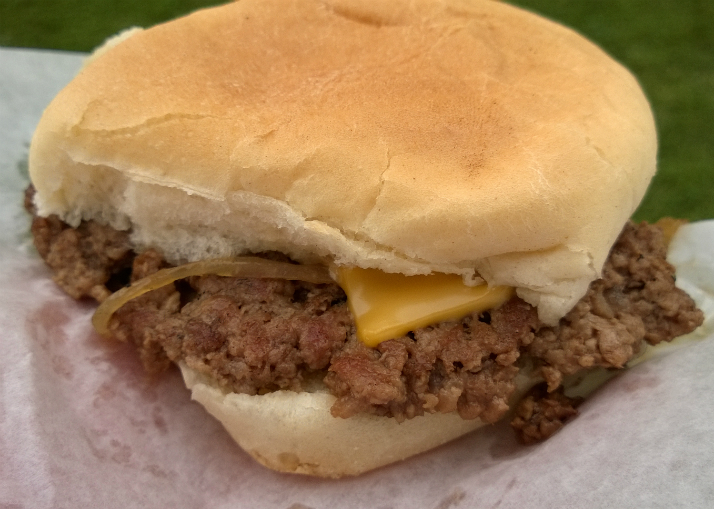 It’s your childhood in a bun…. but better. — THE DEAD DIXIE: This pup is covered in diced green apples, applewood smoked bacon, blue cheese crumbles and their signature bbq sauce! A great way to eat all of your food groups in just one bun! — THE GERMANATOR (DAYTON OKTOBERFEST SPECIAL): Topped with a braised beef brisket, crispy fried onions and a homemade beer cheese. This dog would surely satisfy the appetite of a former Governor of California! “Calling in Dead”: Your childhood in a bun. — NEW DOG #2: It’s not uncommon for one of their new masterpieces to debut nameless. Zombie Dogz enlists their Facebook followers to take part of the naming process! This dog debuted at Oktoberfest as well. Topped with apple cider braised carnitas, spiced apples, arugula, butternut squash puree, and a sage crumble. It is simply Autumn deliciousness, with toppings Chef House can appreciate. — THE NIBBLER:- An American classic turned Zombie! This is their take on a coney is topped in homemade chili, diced red onions, mustard, and muenster cheese. The King likes to tear into these like a dead walker into fresh meat! — KILLER GAUGE – Named after their beloved dog, this hot dog is topped with a buffalo chicken dip, celery bits, blue cheese and ranch. Honorable Mention: THE GRANDE ZOMBE: Pronounced “Grand-ay, zom-bay,” this spicy little number includes queso sauce, shredded lettuce, cilantro sour cream, and crushed corn chips. We like to heat up the night with this graveyard favorite. Also, check out Big Ragu’s favorite, the dessert Zombie Dog called the “RED ROCKET” which is a banana in a bun covered with peanut butter powder, stawberry jelly, white chocolate chips and pop rocks ! **** IMPORTANT: Not every one of these Zombie Dogz are offered all the time. They typically offer a few choices and rotate those throughout the year. David and Lee Ann are always coming up with new flavors, so stay tuned. “Dead Dixie”: Bacon, Apple and Blue Cheese Bliss. From festivals, to food truck rallies, horror conventions, Oktoberfest or special single appearances, Zombie Dogz delivers the goods. Our advice when they are around .. GET THERE EARLY, because this food truck is anything but dead. They are easily the most popular food truck in Dayton. Is it the Zombie Name? Is it the one of a kind, unique toppings? Is it the reasonable prices? The great customer service? For us, it’s all of the above! 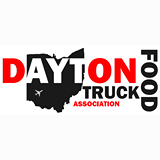 The question we hear most is “Where can I find a schedule of where they are going to be?” The answer is to stay updated through the Food Truck link on Dayton Most Metro or follow Zombie Dogz on their Facebook page. Speaking of Facebook, follow our new Food Adventure Crew with Hungry Jax, Chef House, The King, and the Big Ragu on Facebook by clicking HERE. Cant get enough Zombie Dogz? Then check out the photo gallery below for our huge collection of pictures. 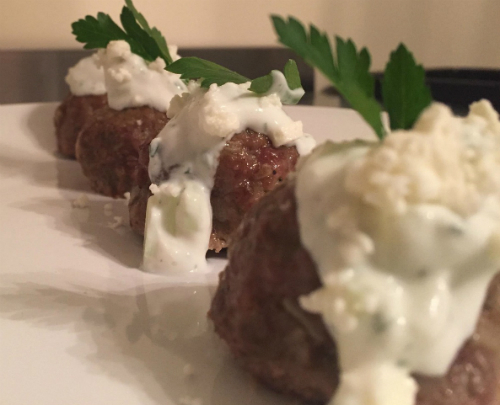 Food Adventures has some fantastic photos of many of their offerings!